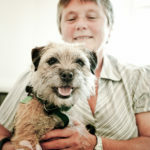 Toffee who is my 9 year old border terrier has been attending K9HS and seen by Barbara and the team since she was just over a year old, having been diagnosed with a back problem and under developed hind quarters. 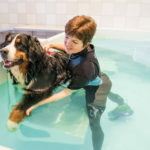 When Toffee first started to attend K9HS she had land based physiotherapy treatment which involved both laser and pulsed magnetic therapy with manual therapies. she then was introduced to water based treatment in the hydro pool. As well as the treatment I was given advise on the best type of harness to use and exercises for her. The first time Toffee had shower and went into the pool she shredded Barbara’s wet suit as did not do water! 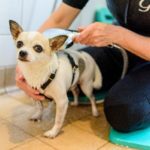 Barbar used Therapeutic Handling, something new to me and worked with Toffee so she now loves to go into the wet room and hydro pool. Having sorted out the problems with Toffee’s back and hind quarters by Barbara and the K9HS team she now has the occasional top up maintenance treatment a few times a year, just to keep her on an even keel. 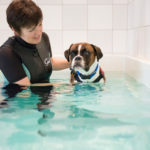 Toffee also attends the teaching clinics to help with the training of the students who attend the various courses which are run from the centre at Earl Soham. It is always a pleasure to go over on the training days as I go from seeing the students not sure if they are going to get the hang of things to WOW I HAVE GOT IT! Toffee is a totally different dog from the one who first went for her first treatment, it was a lucky day for me and my dogs when my vet told me about K9HS, Toffee is not my first dog who has benefited from the first class very friendly professionalism of Barbara and the whole team.